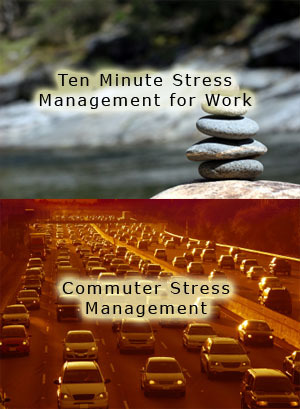 Special Package – Get the Commuter Stress Managemetn & Ten Minute Stress Management for Work for a special price. SAVE. The Commuter Stress Management can be played while driving your car. You do NOT close your eyes but refocus on more relaxing images. Instead of focusing on the frustrations of driving in traffic, you breathe, retax your jaw/shoulders, and look for natural beauty. This technique does make your commute faster, it just gets you where you need to be in a more relaxed state.